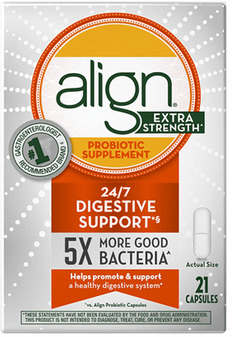 Align is a probiotic supplement manufactured by Procter & Gamble. Four of the current formulas contain one patented and trademarked probiotic strain, Bifantis, scientifically known as Bifidobacterium infantis (B. infantis) 35624. It is the only product in the US that contains this strain at this time. Beware, however, that the other 2 formulas DO NOT contain B. infantis 35624 at all! This strain is backed by research, but the research may not support the conditions for which many practitioners unknowingly recommend it. Read what the research really shows. Marketing materials say it "is the #1 Gastroenterologist recommended probiotic and the most recommended probiotic by doctors as well". This claim is based on a survey published in a QuintilesIMS Claim Substantiation Statement dated August 30, 2017. 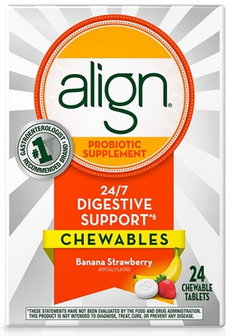 What Are The Ingredients in This Probiotic Supplement? Please always read ingredients before taking any supplement! The ingredients may change depending on the dates the products are manufactured. As of January, 2019, the regular-strength capsules contain 1 billion CFU of Bifidobacterium infantis 35624 at time of manufacture with a minimum level of 10 million CFU until the “best by” date, which is at least 18 months from the manufacture date based on the package I purchased. Other ingredients are microcrystalline cellulose, hypromellose, sucrose (sugar) magnesium stearate (flow agent), sodium caseinate (milk allergy alert! ), titanium dioxide (color), trisodium citrate dihydrate, propyl gallate (antioxidant preservative), gellan gum (thickener). This product contains milk, but is listed to be gluten-free. The extra-strength capsules contain 5 billion CFU when manufactured, and “provides an effective level of bacteria (50 million CFU) until at least the “best by” date.” Other ingredients are microcrystalline cellulose, hypromellose, sucrose, magnesium stearate, sodium caseinate, titanium dioxide (color), trisodium citrate dihydrate, propyl gallate (antioxidant preservative), and gellan gum. 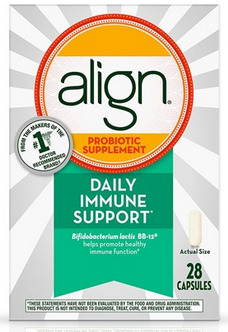 The Daily Immune Support Formula is unique in this line of products. Rather than having B. infantis 35624 in it, it contains B. animalis subsp. lactis BB-12, commonly known as B. lactis BB-12. The amount of BB-12 is five billion CFU at time of manufacture with an effective level of 1 billion until at least the “best by” date. The ingredients of this formula were not online at the time I updated this page, but I will check in my local store and see if it is available. If so, I will update this page. 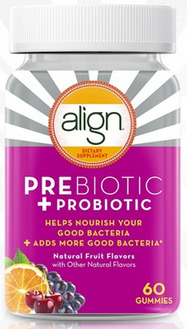 The Align Prebiotic + Probiotic Gummies are an anomaly in this product line. While the other products contain Bifidobacterium strains, this one contains Bacillus coagulans Unique IS-2 at a level of 1 billion CFU in 2 gummies at time of manufacture, plus inulin as a prebiotic. The junior chewables for kids (for ages 6 and older) provides 10 million CFU of B. infantis 35624 until at least the “best by” date. Ingredients listed on the website are sucrose, fructose, microcrystalline cellulose, artificial flavor (? ), com starch, maltodextrin, magnesium stearate, sodium caseinate, propyl gallate (antioxidant preservative), and trisodium citrate dehydrate. There is less than 1 gram of sugar per chewable. It, too, contains milk. Interestingly, the website says there are no artificial sweeteners and no artificial flavors (?) and that it is gluten-free. What is the Recommended Dosage of Align? The manufacturer's recommended dosage is 1-2 units (capsule or tablet, depending on the formula) per day for each age group. The website does caution that you may experience some gas and bloating while your digestive system adjusts to the probiotic. What Are Some Reviews of Align? 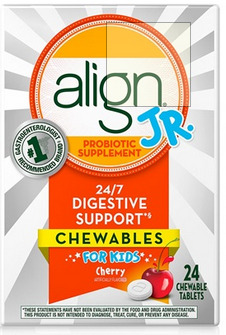 As of January, 2019, on the aligngi.com website, the regular capsules have a 4.36 out of 5 rating, the extra-strength have a 4.73 out of 5 rating, the immune blend has 4.55 out of 5 rating, the adult chewables have a 5 out of 5 rating, the junior chewables have a 4.8 out of 5 rating and the prebiotic+probiotic gummies have a 4.5 out of 5 rating. Some of these reviewers received incentives for their reviews. Therefore, I looked to other retailers for verified-purchase reviews. "I was skeptical for a long time about probiotics but finally decided to try. After years of various digestive issues and experience with different medications, I have to say this one made the nice list. I have experienced relief in several areas due to Align. Day 2 and 3 felt gurgly and unsettled, but after that smooth sailing. 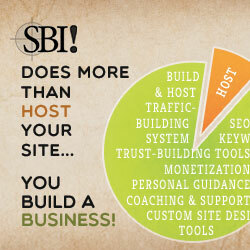 Just be sure to take every day around same time, so you don’t have to start the intro process all over." 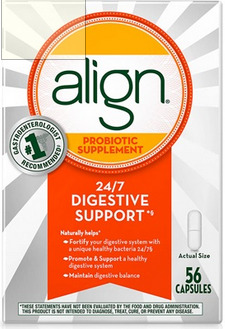 Is Align the Probiotic Supplement for YOU? If you want to determine if this probiotic supplement can help you, read my book about what the research shows, "Bifidobacterium infantis 35624: Not Just for Babies". Purchasers of the book also have free access to the pros and cons of this supplement as I see them. For less than the average cost of ONE box of Align (4-week supply), you can know what the research actually shows and whether or not it may help you. Note that pictures of the packages may differ as packages experience updates. Thanks to Gary for mentioning this supplement. Please let me know what you think!